Late Friday afternoon, reports circulated that Erdogan expressed admiration for Adolf Hitler's Nazi government. If it was a statement made by a democratic figure, it would be treated as a gaffe or bad joke in poor taste. But for the authoritarian Erdogan, it's a rare instance of his honesty, showing how the strongman really feels. Business Insider reported on the links Erdogan made between his vision of the new Turkish government that he is pushing for, and Hitler's regime. "Asked on his return from a visit to Saudi Arabia late on Thursday whether an executive presidential system was possible while maintaining the unitary structure of the state, he said: "There are already examples in the world. You can see it when you look at Hitler's Germany. There are later examples in various other countries," he told reporters, according to a recording broadcast by the Dogan news agency." According to Reuters, Erdogan's government insisted that it's remarks were misconstrued, after domestic and international condemnation. "'If the system is abused it may lead to bad management resulting in disasters as in Hitler's Germany ... The important thing is to pursue fair management that serves the nation,' [Erdogan's] statement said, adding it was unacceptable to suggest Erdogan was casting Hitler's Germany in a positive light." Of course, in Erdogan's Hitleresque state, it would be a crime to suggest that Erdogan admired Hitler. Ironically, you could even be marched off to prison, for suggesting that Erdogan is authoritarian. In fact, Erdogan's government has arrested many people, including journalists and law enforcement officials of uncovering evidence of corruption or accusing him of authoritarian actions. He even targeted people living in the USA who are critical of him. Erdogan's excuse for such actions is that he claims his enemies are "terrorists." "Let's do a close comparison between Hitler and Erdogan," one person wrote on Twitter. "The only difference is that Hitler was a bit shorter." People also shared a Photoshopped picture of Hitler with Mr. Erdogan's face superimposed on it. On a visit to Turkey during their June election, I found that the overwhelming majority of people I met really like their democratic system. 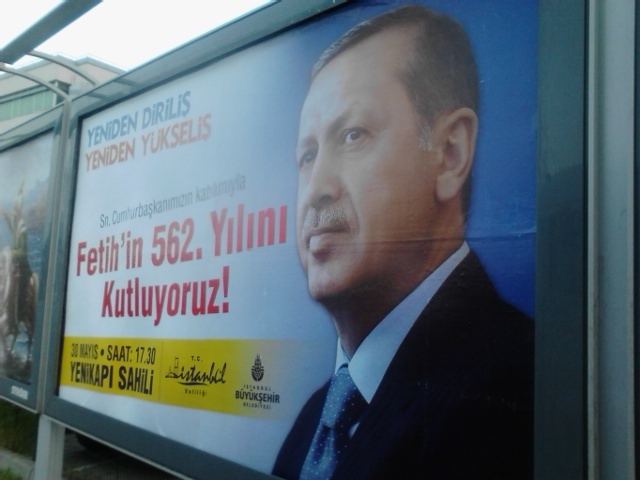 Many didn't like Erdogan, but were afraid to say anything. Of those who did, half asked me to keep it anonymous, while the other half said they would be arrested anyway, and it didn't matter if I used their names. 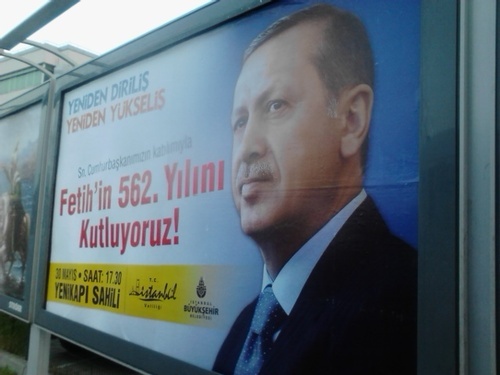 Here's a picture of an election poster for the "ceremonial" Turkish President Recep Tayyip Erdogan from June of 2015. Despite his party's win in the November election, Erdogan's ruling AKP does not have the votes to give their leader the Hitleresque power that he wants. But he is seeking a referendum to get those powers, which would likely ensure that Erdogan and his family will rule this NATO ally of the USA indefinitely, in a most undemocratic manner. Should the United States break diplomatic relations with Erdogan's regime, help Turkey's civil society, review possible cuts to U.S. military aid to Turkey's government, or consider "smart sanctions" against Erdogan and his family? Erdogan's admission of admiration for Hitler demonstrates that doing nothing will not help the problem, any more than it did in the 1930s.